Training is responsible to enhance the job security of the staff in corporations. It also instills association within the employee towards the organization itself. Therefore corporate trainings are a strictly planned phenomenon that facilitates achieving both the organizational and employee goals. A well-trained employee is a satisfied, competent, motivated and a loyal employee who becomes an integral part organization. As a matter of fact, the progressive organizations consider the training of employees is their major investment. Training has many advantages the foremost being that it reduces employee turnover rate and multiplies steadiness and growth within the management system. However, the organizations of today tend to spend a lot without gaining any or satisfactory results from these training sessions. This happens due to depending in information overload which confuses the management and the decision makers. Also, because of redundancy and ambiguous nature of this information it becomes difficult to extract the relative and precise data for the purpose of research, study or analysis. Thus, the assessment phase fails as it cannot be depended upon for the purpose of setting goal, targets or approaches. At this point any help from technological point of view is more than welcomed by the management of the corporate sector. This not only makes them autonomous to a certain extent but, also help in quantifying the vague and intangible factors that they are trying to study meticulously. One such technological support comes from Balanced Scorecards that allow the various internal and external factors to be identified, quantified, defined with the help of ranges and then scored based on actual performances. A typical Balanced Scorecard entails; learning progress, behavior progress, business progress and fulfillment of social contract. These four aspect or metrics are further defined on the basis of sub categories or indicators. These indicators are unique in nature and cannot be used more than once for a particular scenario. 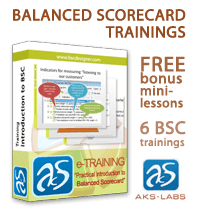 Balanced scorecard offer real-time data, where it can be collected, retrieved or interchanged with ease. The management can use these scorecards to extract information through the various indicators and metrics. This helps them to collect and review results which are summarized in numeric for and hence offer accuracy and objective view to the training issues helping to design targets for the training session and a criterion for evaluation once the training is completed. It also offers various tools like; stop lights and strategy maps which are visually very appealing for the purpose of presenting data in a meeting or in front of the decision makers. Balanced Scorecards enables to define the degree to which individuals are expected to perform to achieve efficiency and helps to increase the possibility of effective management and has a positive impact on the overall business.